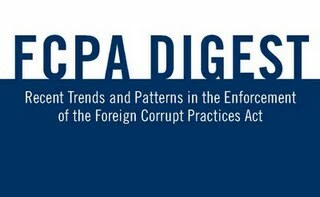 We've mentioned before Dan Newcomb's FCPA Digest, calling it the most definitive publicly-available catalog of FCPA prosecutions, enforcement actions and disclosed investigations. So it's great to see the release of the March 2009 version, available here. This year, Philip Urofsky becomes editor-in-chief. He told us last week, "In this Digest, we entirely scrapped the previous Trends & Patterns, which had largely become a statistical update, and replaced it with a more analytical piece." The T&P section has always been a favorite of ours, and this year's new-and-improved version (available here) didn't disappoint. More recently, there is a strong trend of actions against individuals being brought separately or even in advance of charges against their employers and then, in all likelihood, following classic prosecutorial strategy of working up the chain of command, using the individuals to build the government’s case against their superiors and eventually the company. In Willbros, the DOJ charged four employees over a two-year period, with two pleading in previous years (Steph and Brown) and an indictment being returned against two others (Tillery and Novak) in February 2008. Finally, in May 2008, Willbros Group and Willbros International agreed to a deferred prosecution agreement. Similarly, the DOJ entered into a plea agreement with the former CEO of KBR, Stanley, in 2008, well in advance of settling the matter with Halliburton/KBR in early 2009. A final trend and pattern worth noting is the SEC’s continued demand for disgorgement of ill-gotten profits in cases in which only books & records violations are charged, such as in the [oil for food] cases. Whether or not a false entry in a company’s books and records (or a failure to implement adequate internal controls) truly results in increased profits is open to question. To date, however, no FCPA defendant has publicly challenged the SEC on whether disgorgement is appropriate when the sole charge is false books and records. Prior to the ABB case in 2004, the SEC had never collected disgorgement in FCPA cases; since then it has sought it in virtually every case with only a few exceptions, such as Dow Chemical, Delta & Pine Land, Lucent, and Conway. In Tyco, the SEC collected $1 in ill-gotten gains (along with $50 million in penalties related to other violations). While this is an isolated example of the SEC seeking such nominal disgorgement, the case does underscore the overall policy of levying disgorgement sanctions in nearly all cases against issuers. We spend a lot of time in the FCPA Digest. And whenever we turn to it, we're grateful for the hard work and generosity of founding-editor Dan Newcomb, Philip Urofsky and their entire team. California-based Con-way, Inc., a global freight forwarder, has paid a $300,000 penalty and accepted a cease and desist order to settle a Foreign Corrupt Practices Act enforcement action with the Securities and Exchange Commission. Con-way's FCPA violations were caused by a Philippines-based subsidiary, Emery Transnational. It made about $244,000 in improper payments between 2000 and 2003 to officials at the Philippines Bureau of Customs and the Philippine Economic Zone Area, and $173,000 in improper payments to officials at fourteen state-owned airlines. The bribes to customs officials consisted of hundreds of small payments. They were intended to induce the officials to violate customs regulations, settle customs disputes, and reduce or not enforce otherwise legitimate fines for administrative violations. To fund the payments, Emery's employees obtained cash advances to complete customs processing. The SEC said that "unlike legitimate customs payments, the payments at issue were not supported by receipts from the Philippines Bureau of Customs and the Philippine Economic Zone Area. Emery Transnational did not identify the true nature of these payments in its books and records." Emery's employees also made corrupt payments between 2000 and 2003 to employees at fourteen state-owned airlines that did business in the Philippines. According to the SEC, the "payments were made with the intent of improperly influencing the acts and decisions of these foreign officials and to secure a business advantage or economic benefit." There were “weight shipped” payments intended to induce airline officials to improperly reserve space for Emery on the airplanes, and “gain shares” payments to induce airline officials to falsely under-weigh shipments and to consolidate multiple shipments into a single shipment, resulting in lower shipping charges. Emery paid the airline employees 90% of the reduced shipping costs. Government-owned or controlled airlines receiving payments were Air France, Alitalia (Italy), China Airlines, EgyptAir, Emirates (Dubai), Gulf Air (Bahrain, Abu Dhabi, Oman), Kuwait Airways, Malaysian Airlines, Pakistan International Airlines, Royal Brunei Airlines, Saudi Arabian Airlines, SilkAir (Singapore), Singapore Airlines, and Thai Airways International. According to the SEC's complaint, none of Emery's improper payments were accurately reflected in Con-way’s books and records. Also, Con-way knowingly failed to implement a system of internal accounting controls concerning Emery that would both ensure that Emery complied with the FCPA and require that the payments it made to foreign officials were accurately reflected on its books and records. As a result, Con-way violated Sections 13(b)(2)(A), 13(b)(2)(B), and 13(b)(5) of the Securities Exchange Act of 1934 (15 U.S.C. §§ 78m(b)(2)(A) and 78m(b)(2)(B)). Con-way discovered the illegal conduct at Emery in early 2003. After a preliminary internal investigation, Con-way self-disclosed the potential FCPA violations to the SEC. Following a more thorough internal investigation, Con-way imposed strict financial reporting and compliance requirements on Emery, fired a number of Emery employees involved in the misconduct, provided FCPA training and education to Con-way's own employees and strengthened its compliance program. In December 2004, Con-way sold Emery to UPS. In the Philippines, payments to customs officials by local employees are a common compliance problem. Such payments are locally referred to as "facilitating payments" but shouldn't be confused with payments of the same name that are permitted under the FCPA. There's an exception in the FCPA for facilitating payments -- but only as defined by the FCPA itself. Among other things, the payments must be for “routine governmental action . . . which is ordinarily and commonly performed by a foreign official." See 15 U.S.C. §§78dd-1 (b) and (f) (3) [Section 30A of the Securities Exchange Act of 1934]. The exception will not apply, however, if there was no legitimate routine governmental action pending and for which the payment was made. A governmental action obtained or sought to be obtained by subornation of the official’s duty is not an action “ordinarily and commonly performed by a foreign official” and therefore is outside the scope of the exception. For example, paying a customs clerk to schedule an inspection of goods already in the customs queue may be permissible. But paying a customs clerk to jump the queue, or paying for positive inspection results, may be outside the exception. Emery's payments to customs officials were intended to induce them to (i) violate customs regulations by allowing Emery to store shipments longer than otherwise permitted, thus saving the company transportation costs related to its inbound shipments; and (ii) improperly settle Emery's disputes with the Philippines Bureau of Customs, or to reduce or not enforce otherwise legitimate fines for administrative violations. Those clearly weren't actions “ordinarily and commonly performed by a foreign official.” That's why the payments fell outside the scope of the FCPA's facilitating payments exception. And whether or not the payments were permissible, Con-way was required to accurately account for them in its books and records, which it didn't do. The case is also a reminder that employees of government- owned or controlled airlines are "foreign officials" for purposes of the FCPA. Contact with them, either directly or through travel agents or others, should be covered by compliance programs. Con-way Inc. trades on the NYSE under the symbol CNW. View SEC Litigation Release No. 20690 and Accounting and Auditing Enforcement Release No. 2866 (August 27, 2008) here. View the Complaint in Securities and Exchange Commission v. Con-way Inc., Civil Action No. 1:08-CV-01478 (D.D.C.) (EGS) here. View the SEC's Administrative Enforcement Action / Cease and Desist Order here.